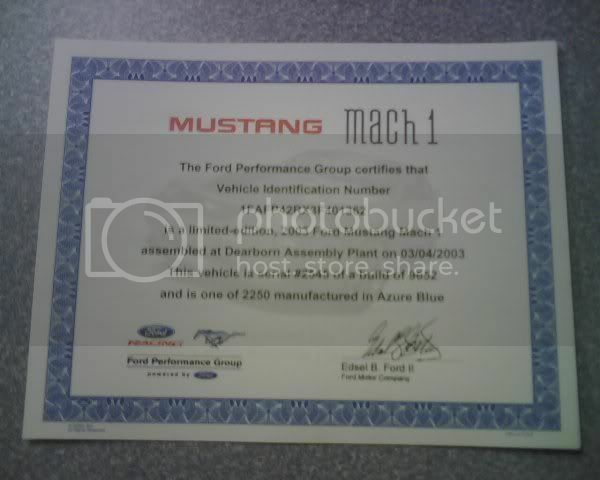 Mach 1 Registry & Ford Performance Group partnership!! 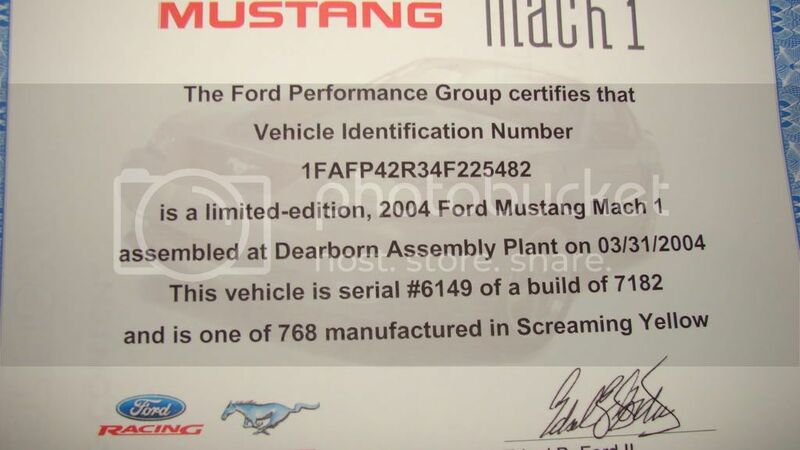 Re: Mach 1 Registry & Ford Performance Group partnership!! I just ordered mine! My Mach is #741 which is kind of interesting as the VIN is 366471. Just reorder the last three digits of the VIN # and you get the build #. If so, my car is #004. That would make it one of the first. We will see soon. That shoots that down, my car is #3200. I was SO looking forward to having the fourth one made. Guys, how long did it take for you to get your certificates? Got mine today, also. Build date 01/31/03 number 1682 of 9652, and in the rarest color of course - Oxford White (814) of the 03' Models. Turbo-charged 2003 OxFord White Mach 1 "Mandy"
Two defining forces died for you. Jesus Christ died for your soul. The American Soldier died for your freedom. Think about it. I got mine today. It took 11 days to get here. The car on the cert is DSG. Does the color of the car in the background match everyone's car? - See pics of my 2003 Mach 1 Web Page, needs update for new motor, etc. Received my certificate on 10/20/2008 which is the 5th. birthday of my Mach1. The build date is 10/06/2003 and serial #328 of 7182 and 1 of 1039 comp orange color. Mods; catted MRT H pipe, Magnaflow catback, C&L cai tube, PHP spacer, UPR upper/lower control arms, 35 % tint, Alum. drive shaft, AUBURN posi, Moser 31 spline axles, Richmond 410 ring & pinion, NT05R 275/40/17 drag radials, Diablo tuned, Dyno tuned by Johnny Lightning Dynoed at; 270 Hp 302 torque. I just received mine yesterday. Sweet. Mine isn't a low number off the assembly line like four thousand something out of the seven thousand something built for '04, but still cool all the same. As I don't ever plan on getting rid of this car I like having every piece of paper I can on it. How about someone posting up a pic of their certificate?? I received mine Oct. 4th and posted pix of a copy I made in a frame on this thread but here is the original in all it's glory. I couldn't repair your brakes, so I made your horn louder. Mach 1 owner since January 1969. First ride in a P51D August 28,2010. Based in Kent, Washington, Pacific Cascade Mustang Club is the only original Mustang club in the Puget Sound Area and according to Mustang Club of America, we are the oldest in the nation. Interesting...I also received my cert on Monday...build date 10/9/03 (one day before your's) with a sequence # of 667. Last six digits of my VIN are 135297. Well, for the '04 Machs, it was likely built on 10/9/03 (or 10/8/03) because I have #667 (build date 10/9/03)...almost too close for comfort. Need some help too. Called and they cannot find. Ordered today, FYI anyone else have a suffix such as Sr., Jr., III at the end of your name may have to search that way. Thanks again Dave for putting this all togather. Look how late my car was, still a distance away from being the last though..